Campaigns, Fannin Regional Hospital - Orthopedics - Why Choose Us? If bone, joint or back problems have brought your life to a halt, count on the expert team, at Fannin Regional Hospital, to help put you back in motion. Our orthopedic surgeons specialize in treating a wide range of injuries and disorders - from traumatic and sports-related conditions, to chronic and debilitating joint pain. So whether you want to reclaim your golf game or just walk up your stairs with greater ease, know that skilled orthopedic care is close by. 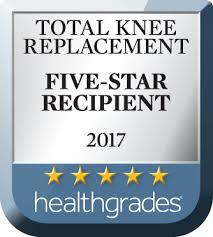 Fannin Regional Hospital recently announced it has achieved 5-stars for its performance in Total Knee Replacement from Healthgrades. Healthgrades is the leading online resource helping consumers make informed decisions to find the right doctor, the right hospital for the right care. This achievement is part of new findings and data recently released by Healthgrades and is featured in the Healthgrades 2017 Report to the Nation. Hand & Wrist Care: Whether your condition is common or complex, the surgeons, at Fannin Regional Hospital, have the skilled hands to help heal yours. When non-invasive options fail to relieve your pain, they use minimally invasive techniques whenever possible, including endoscopic carpal tunnel release. This procedure uses a thin, flexible tube with a camera attached (endoscope), which your surgeon guides through a small incision in the wrist to see and treat the issue. Because endoscopy doesn't require a large open incision, it often allows for less pain and scarring and a faster recovery than traditional procedures.